But first the intro. Marrakesh sits about 16 miles east of Palm Springs in Palm Desert and is a private golf course, country club and condo complex built in the 70's. The developer was Johnny Dawson, the designer was John Elign Woolf and the architect was Richard Harrison. 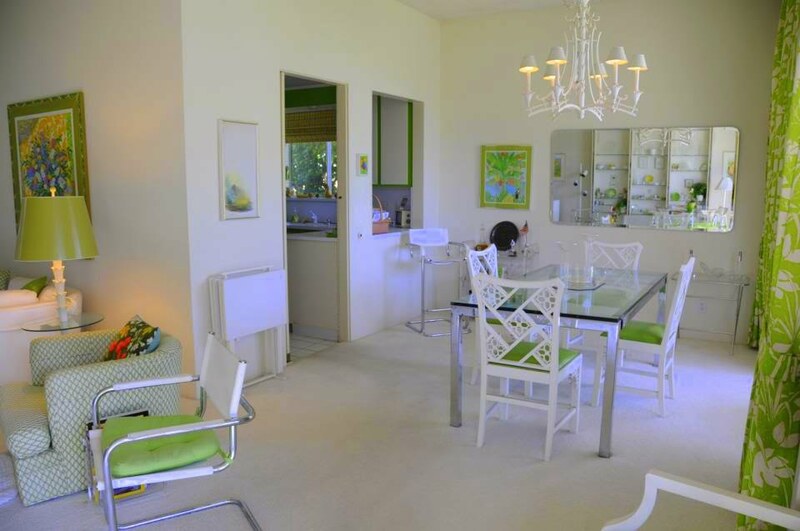 It is a gorgeous piece of property and very Hollywood Regency in its decor both outside and inside the units. The Marrakesh Designer Showcase was two years in the making, according to Chair Gina Corbett, and featured five homes specially decorated and staged by designers. 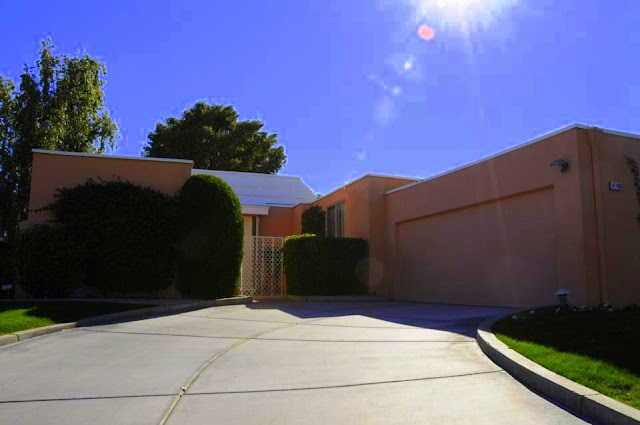 They also decided to include one very special home they titled, "Marrakesh Then." We arrived at the property right on time and were ushered into the club house by the lovely volunteers of the Designer Showcase who checked us into the tour and the luncheon. Then we were instructed to wait outside for a golf cart. We quickly spotted a lineup of golf carts with polite and handsome men (nothing wrong with that) waiting to whisk us around the property on our home tour. Although the surroundings were pleasant, I was still on the fence. This was the second event of our third day of home and garden tours, running around from dawn to dusk. 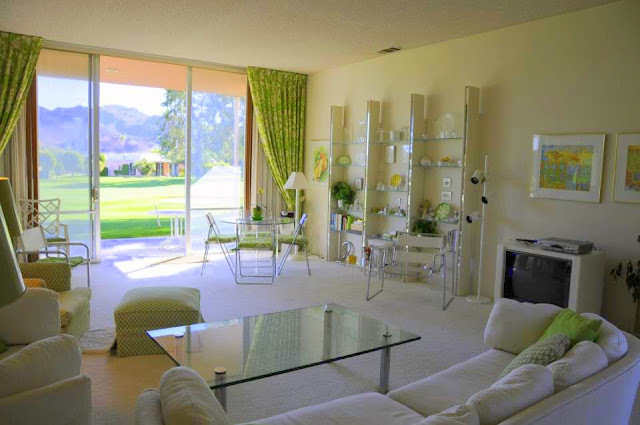 We had seen homes by every major mid-century modern architect working in Southern California. Go ahead. Wow me. The above color coordinated scene in my favorite color is exactly what you see when you walk in the front door. I immediately sensed a distinctly 70's vibe and had a quick side bar with the volunteer and discovered that, in fact, we had struck late mid-century modern gold. This was a time capsule home, virtually untouched from 1971. Yee-haw! I was able to reach the owner of this little 70's miracle, Ann Judy, who was given the condo in 2000 by her late parents, Bud and Dede Clary. God bless all three of them for hardly touching a thing in this house. Ann told me that Bud and Dede were the third owners of the home and purchased it in the 90's. 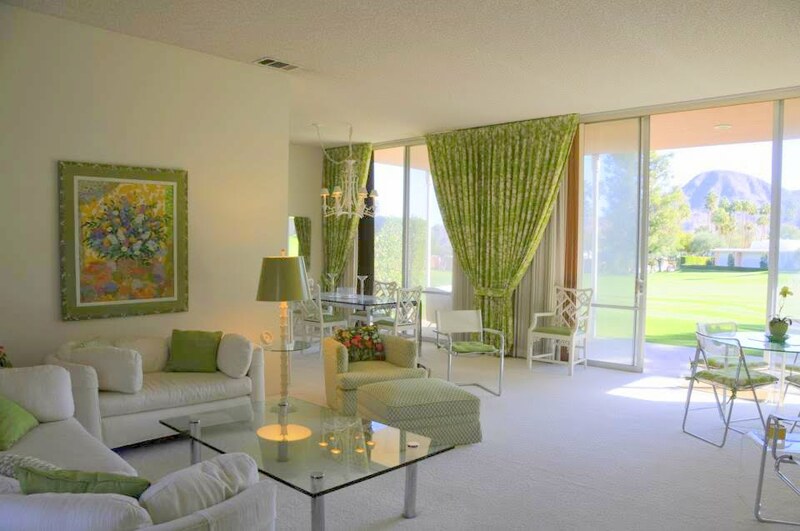 Ann says the only thing her mother contributed to the decor was she swapped out the BRIGHT GREEN shag carpet for white and also recovered the sofas in white fabric as they were upholstered in the same print as the drapes. OMG. It had to be bright. But delightful. When the Marrakesh tour publicity photos came out, the original designer for the condo, Ed Carlmark, saw the published photos of Ann's condo and realized that he was the decorator, some 40 years ago, and the condo looked virtually as he had designed it. Ann Judy with Ed Carlmark showing him the original china purchased to match the condo. Darn good designer. Check out this kitchen. Original Formica. Original stove. Original everything. Ed was kind enough to help Ann with staging the home for the tour. 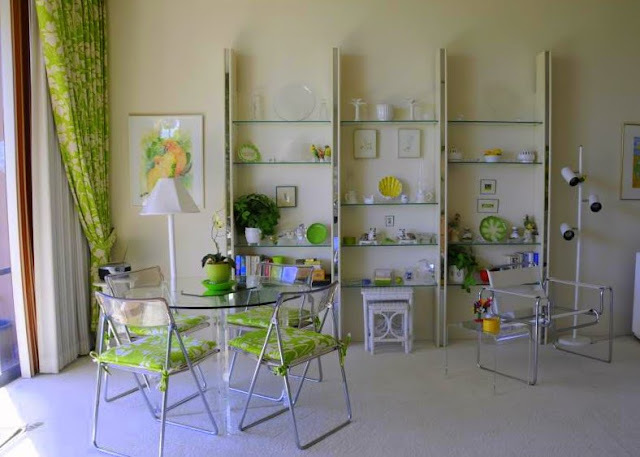 Ann said she gave him free rein to rearrange anything he wanted and go digging through the cupboards. Ed found, neatly packed away by Ann's mother, the original bedspreads, dining room chandelier green shades as well as original towels (bright yellow and green). Thank you Dede. The table is decorated with original china and silverware purchased to match the decor. In this photo you see the original lampshades Ed found in a closet. At this point, in the tour I was nearly hyperventilating. How could this home get any better? Ignore the artificial pet. Apparently Ed has a sense of humor. Having this sofa at the foot of your bed would certainly wake you up every morning. Look at the stenciling detail on the desk. Incredible. Ann said her mom found the place happy and cheerful. How can you not smile looking at these bright and pleasant rooms? And then I walked into the guest bathroom. Seriously. Foil wallpaper. Have I just died and gone to 70's heaven? The towels coordinate and are original to the home!!! Pretty exciting stuff. I staggered out of the bathroom heading down the hall towards the other bedroom. This 70's wallpaper is insanely pink and madly busy. The yellow daffodil lamp. How can you not love it? 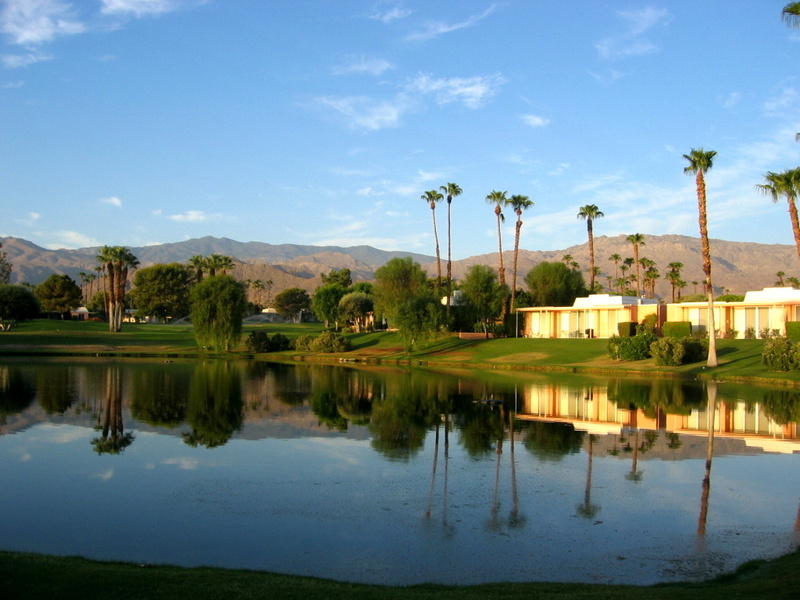 Ann said her mother prized the view of the golf course and the mountains behind it, and her dad adored golfing. The little condo in the desert was a win-win. Ann says it best, "Good style, good taste, and quality materials stand the test of time." That reminds me so much of how I decorated in the early 70s! 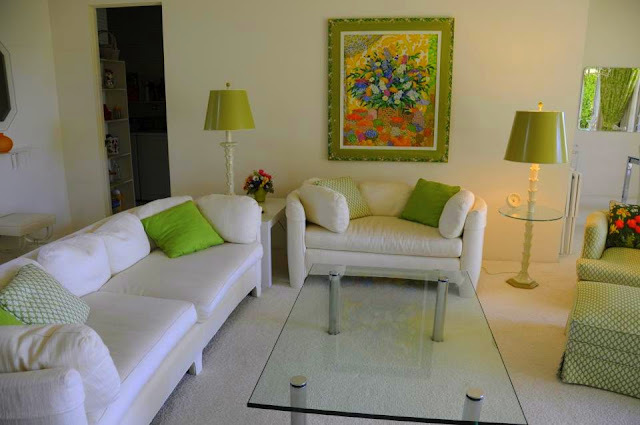 What really amazes me is how all the furnishings have remained so new-looking. Nothing looks tired or worn at all. Even more amazing is Palm Desert sees plenty of days in the 105+ temperature range so the sun has to beat through those windows. My only explanation is that this is a seasonal and/or vacation property that perhaps wasn't used a ton. Even so, this home is still 40 years old, which means all four owners have taken exceedingly good care of it. It has retained it's newness, hasn't it? I loved the kitchen and that green foil wallpaper. BOOM indeed! And the lamps? What a happy place. It is a happy home. I literally skipped through it snapping photos all the way with a big grin on my face. YOWZA. This has just raced to the top of my DREAM HOUSE list! Thank you! Thank for stopping by Pam! Isn't it just the coolest? I wasn't expecting to see a time capsule on this particular tour so the surprise and incredible wonderfulness of it almost knocked me over. Rebecca, you did a fabulous job of bringing our Marrakesh home alive in your blog. How could anyone read your WOWS and BOOMS with your fabulous pictures and not run to the nearest airport to come visit. We are indeed a special place and we could not have been prouder to share it with Modernism Week and all of our visitors. Can't wait to read next week's blog. Gena, you and your team did a fantastic job with the tour. Everything was organized to a "t". Your hard work really showed. And what a treat. I have some many great pictures to share. Thanks again for your Marrakesh hospitality! What's not to love about this place. Maybe homes take on the spirit of their owners. The daughter said her parents were happy here. I love it ALL. I kind of want to live there. This home has clearly only been lived in by happy and super FUN people. Thank you Rebecca for the walk down memory lane. Your photos are fabulous. Wish I could have been there too. Amazing! A very happy lovely home! I gasped (with joy) at the wallpaper in the bathrooms - but particularly in the second bathroom. I really love it. Such a light and bright home. I couldn't decide which bathroom I loved more, they are both so wonderful ... but if you forced me to vote, I might pick the green foil. Absolutely amazing! And it all looks so brand new. Someone definitely took good care of that place - and their design vision. Those bathrooms...hallelujah. Agreed. They took impeccable care of this pretty little home. I wouldn't change one thing about this place, either. It truly is the happiest house I've ever seen. I can't even imagine being sad even a day in this place. It is truly the cheerful home I have ever been in. Good vibes through and through. This is definitely someone's happy place. Thank you so much, Rebecca, for sharing its delights with us and tipping off Pam so she could share it with RetroRenovators, too. This just might be the sweetest and bounciest home I've seen yet! You are welcome! I am really glad Pam posted as well. This looks like a showcase home. It is so beautifully done. I'm happy that it has retained its originality. All the bold colors are typical of the times. They made me come alive as I looked at every photo. If I had the means, I would buy a house and do it similarly. This was a jovial time for me. The colors are incredibly bold. I keep wondering why the hot sun through the windows didn't fade them but believe the owners were probably very rigorous about closing the drapes during direct sunlight. Over here from Retro Renovation, and agog with love. My grammy didn't have a decorator per se, but went with some orange and yellow décor much like this in the 70s, and so these pictures make me ache in the best way! I hope, hope, hope that represented on that little perfume tray in the bath is a bottle of Charlie! That is a very funny comment about Charlie perfume! I forgot that. Super house! I feel happier just looking at it. Love absolutely everything about it and that gorgeous mountain view looks like a huge framed painting! Thanks so much for taking that tour and sharing. You are welcome. The pleasure was ALL mine. It's absolutely unbelievable that with so many owners, no one tore it up. I think that just proves the quality of the design. It certainly is a delight! Boom is right! And the bathroom with the perfumes arranged on a mirror with Youth Dew, Chloe and Norell. If that tray held a bottle of Opium that easily could easily have been my mother's bathroom. Thanks so much for the wonderful pictures. You are welcome. It was so fun to walk through!